While I was off exploring Southern California with the youth group, I hunkered down during the 18+ hour bus rides with my crochet hook and a couple of skeins of some soft bamboo mix yarns. I had it in mind to make a prayer shawl to send to my grandmother. See, the trip was centered on a Catholic youth retreat in San Diego, and I was going as a chaperone. This whole past year and a half has been pretty Catholic for me: I finished RCIA and took my first Communion and had my Confirmation last Easter, I became an art teacher at a local Catholic school, AND I was one of my own students' sponsor for her Confirmation this year. Then there was this trip with the youth group last week for a huge retreat called Steubenville. It was really cool, and the whole time I kept going over my Catholic journey in the back of my mind. 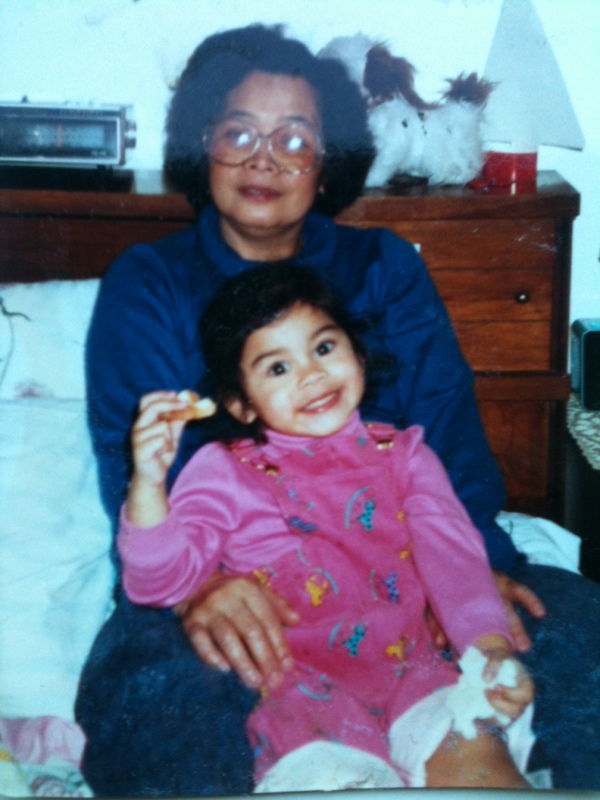 My grandmother is inseparable in my mind from my religion. Well, my whole family is part of my religion. But my grandmother is most closely linked with my conversion in my adolescence because of her great and gentle influence. So it seemed right that while I crochet this scarf, I put all my thoughts and prayers for my grandmother into it. There is something about making things with your hands... for me it's always seemed that part of the woven structure is made out of my thoughts and concentrations when I put my heart into something. So I think of my gramma while I crochet... And I've been home from the trip for a few days now and I admit it did not get done on time. It's hard for me to only crochet and give all my attention to it for a length of time. I get restless and I turn on Star Trek or I plug in a video game. But those distractions feel like they make the quality of the scarf less sacred. I have to find a time to set aside and only meditate on the stitches, on my gramma, and on Grace. The scarf is named "Lucky" after my gramma; her name, Fortunata, means "blessed and good fortune." You can see some of the details and my progress on this project at Ravelry. Disclaimer: I'm not the best at following patterns or writing them... actually I rarely use patterns at all, so I'm sorry for the awkwardness that follows. Hook: 5.5 mm (I) crochet (I like the bamboo handle ones, just FYI); also get yo self a darning needle. Gauge: derp. I guess I didn't really think about this (lies, I NEVER think about guage), I just eyeball what seems right to me. Skill Level: nOOb, it's pretty much the same thing over and over again, so turn on an episode of Star Trek or meditate on your elderly relatives. If you figure out a way to read paperbacks while crocheting, please tell me how you do it! Okie dokie, let's get started! Begin by chaining 65. This will make the width of the shawl (actually 61 stitches wide), you'll decide the length based on how long you keep the crochet up. Make sure the chain is very loose (this will make the shawl stretchy when it's done). This shawl is very chunky and big. It will probably wind around my little gramma a couple of times. If you'd like a thinner scarf instead of a shawl, reduce the initial chain length, just make sure to chain an even number, then chain 5 more (the extra 5 will be one more stitch in the width). Row 1: Double crochet in the 6th chain from the end. Add one single chain onto the end of the double crochet. 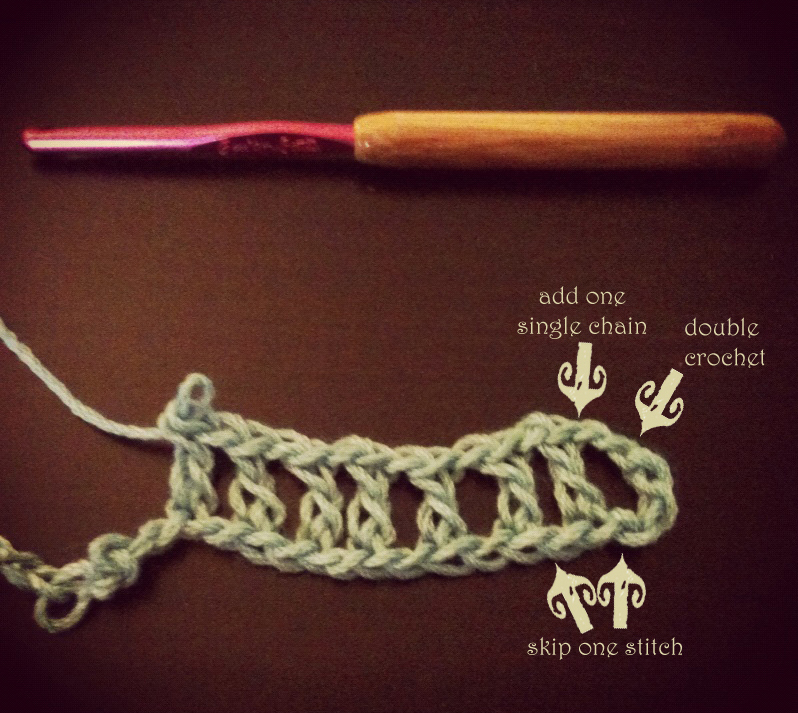 Skip one single chain on the beginning chain, then double crochet in the next. Continue this pattern to the end of the chain. If you started out with an even number chain plus 5 more, your last double crochet should be in the very last single chain. Chain 3. Turn your work. Row 2: Double crochet in the very next stitch. Add one single chain to the end of this double crochet. Skip one stitch and double crochet in the next stitch. Continue to the end of the row. The last double crochet in this pattern will leave one empty stitch at the end. 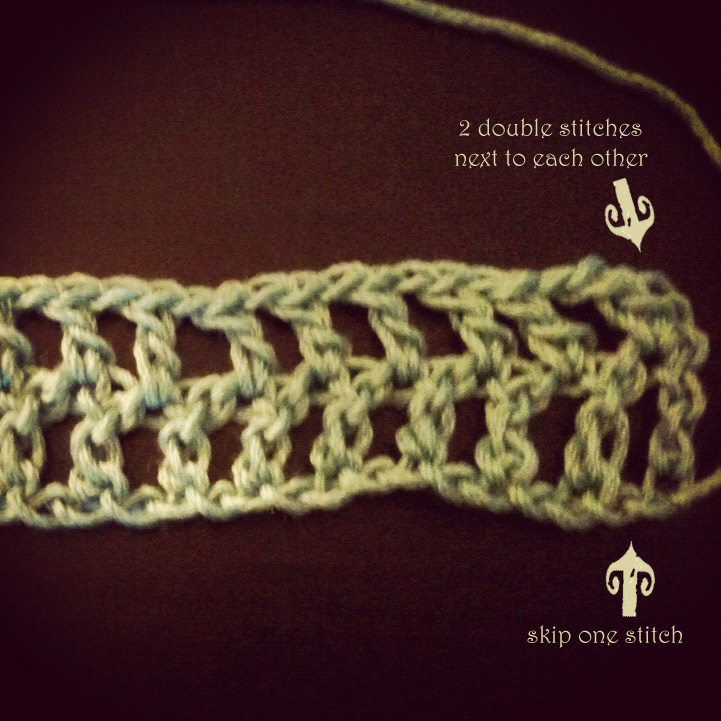 Double crochet into this stitch, then chain 4. Turn your work. 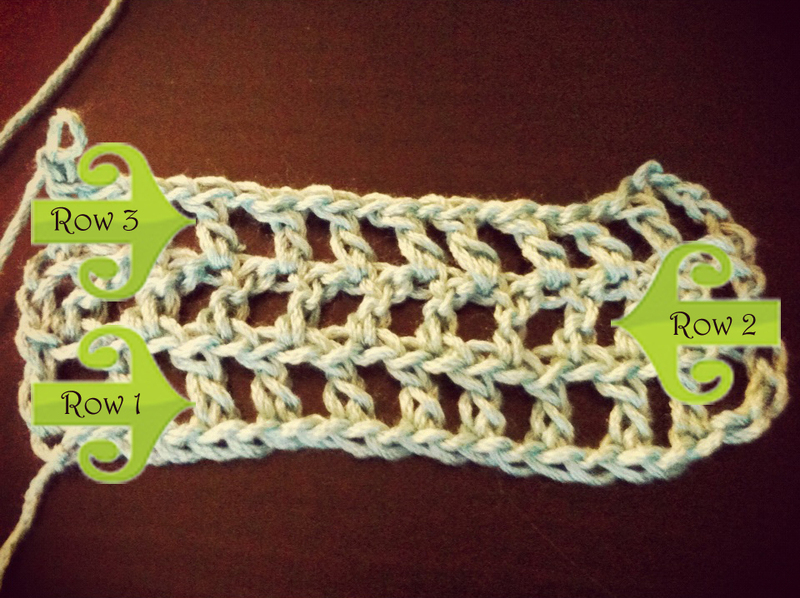 Row 3: Skip one stitch, double crochet in the next stitch. Continue the double crochet and skipping stitch to the end of the row, the last double crochet in this row should be in the very last stitch. By now you are probably noticing the overall pattern. With all this skipping deal, you're making an alternating woven stitch in the fabric, like a checkerboard with empty squares. Continue the Rows 1 and 2 alternating which rows include two double stitches side by side on both ends. 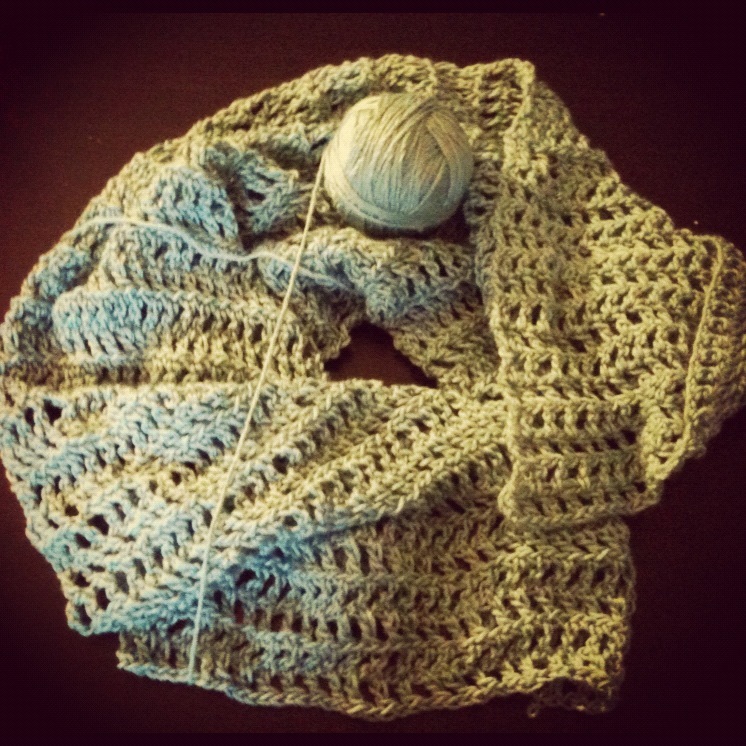 When you have reached the length shawl/ scarf you want, it's time to finish off. Lay out the scarf evenly on a flat surface and give it one twist so that the top of one end is now aligned with the bottom of the other. 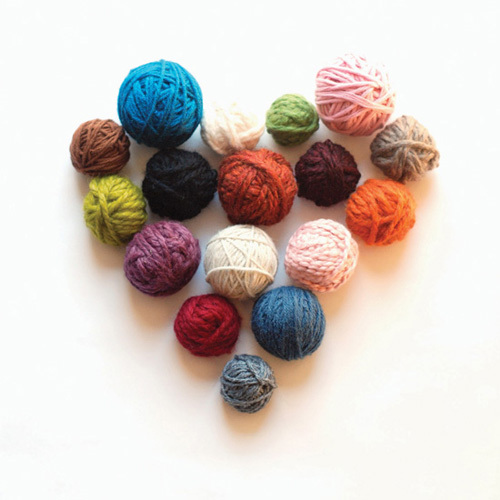 With the twist, use a darning needle and some matching yarn to sew the two ends together. I don't have any pictures for this because, ahem, I haven't gotten that far yet O.o So look for updates!